Life has been a little busy since my last update - mostly good. I was in the ER one night for A-Flutter but my team in California and my doctors here were able to figure out a way to get me out of it without me having to go up there. So far since then, I've felt pretty good. Still on oxygen 24/7, but I feel like I could possibly try to go down to using pulse instead of continuous flow. I'll let you know how that goes. Many of you know that I am a camp counselor for a camp called Nick and Kelly Children's Heart Fund. We send kids with CHD up to camp for 5 days free of charge. At camp kids get to go horseback riding, canoeing, swimming, zip-lining and a whole bunch of other "normal" kid activities. For 5 days out of the year these campers are surrounded by other kids and adults who understand what it is like to live with CHD. They are no longer the odd man out or the "sick one" of their peer group. The lives of these campers are drastically changed after camp, I know mine was. And even as a counselor my life changed after camp. I got to see young kids fill up with hope, overcome obstacles and realize their own self worth. It is the most rewarding thing I have ever done in my whole life. We are short on counselors for this year's camp session. I am inviting you to apply for camp up in Prescott Arizona for camp. It is from July 22nd (Staff day) - 27th. Our theme this year is Space! If you or anyone you know is 18+, good with kids and has a true passion for volunteering or working with kids who have chronic illnesses - please take a look at our flyer and send it out. 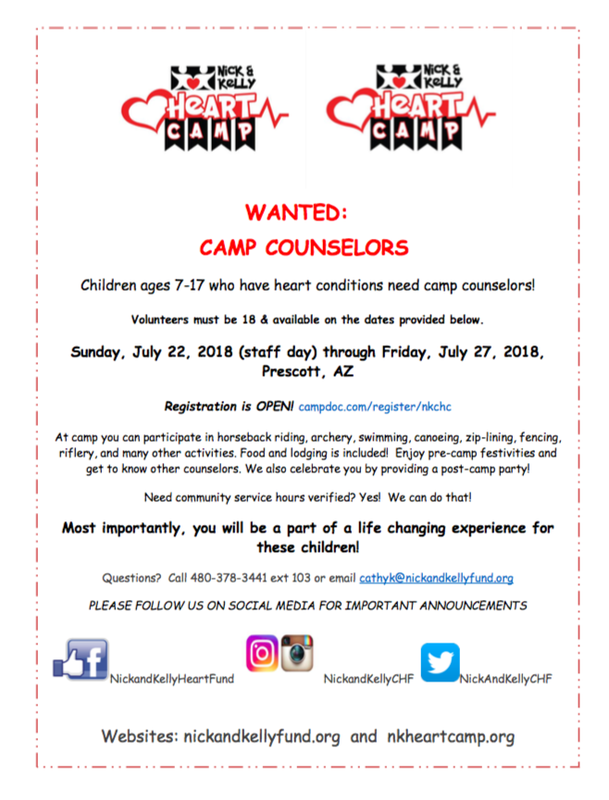 You can apply at: app.campdoc.com/register/nkchc We would love to have you. You will change lives and be changed by these amazing kids.